Members of the Mechanical Division brainstorm ideas for a drive train, the system that moves the entire robot. Ideas that seem promising at this stage can be made into a CAD (Computer Aided Design) file so that the proportions can be tweaked and a prototype can be made. It’s autumn, and those of you caught up in football and the start of NHL hockey and the NBA may not be aware of it, but robotics season is almost here. 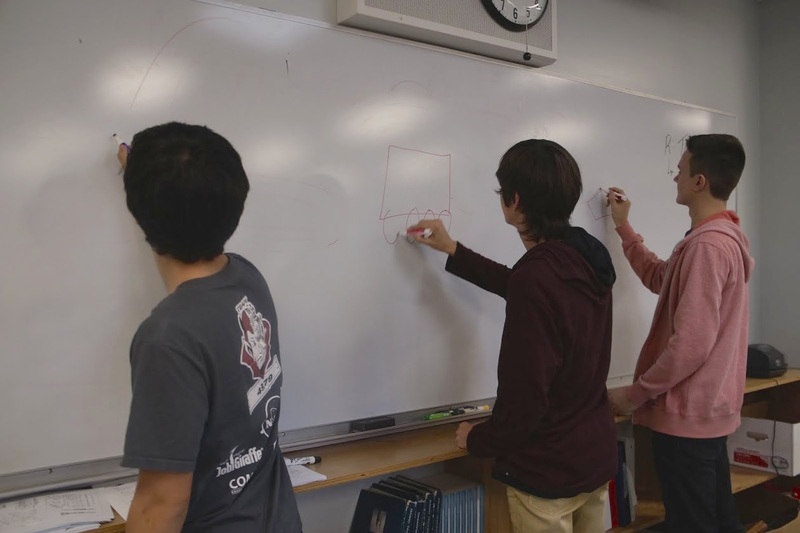 For DevilStorm Robotics, the JobGiraffe sponsored team from Hinsdale Central High School, the new “Build Season” will kickoff on January 3, 2015, when the FRC (FIRST Robotics Competition) announces this year’s challenge. Every year is a different game, requiring robots with different skills and abilities. Once the DevilStorm team finds out the new challenge, they have six weeks to build and test a robot designed to play the new game. The DevilStorm team is broken up into different divisions, Programming, Mechanical, Electrical, etc., each responsible for a different phase of the completed robot. The team is now in “pre-season”, with members from last year sharpening and adding to their skills while teaching new members what they need to know to contribute to the project. Pre-season is also the time for fund raising and applying for grants. For now, the team meets every Tuesday, but once Build Season starts, it will be every day for six weeks until their robot is complete. Everyone at JobGiraffe is excited about our sponsorship of the DevilStorm Robotics team and is anticipating a great season! Last season, the JobGiraffe sponsored DevilStorm Robotics team from Hinsdale Central High School competed in early April at the Midwest Regional Competition at the UIC Pavilion and later that month at the World Championships at the Edward Jones Dome in St. Louis. At the Midwest Regional Competition, the DevilStorm team was on the winning alliance for 6 of the 12 matches in which they competed and was ranked 29th out of the 54 teams that were present. They also received the Rookie All-Star Award for the Midwest Region. 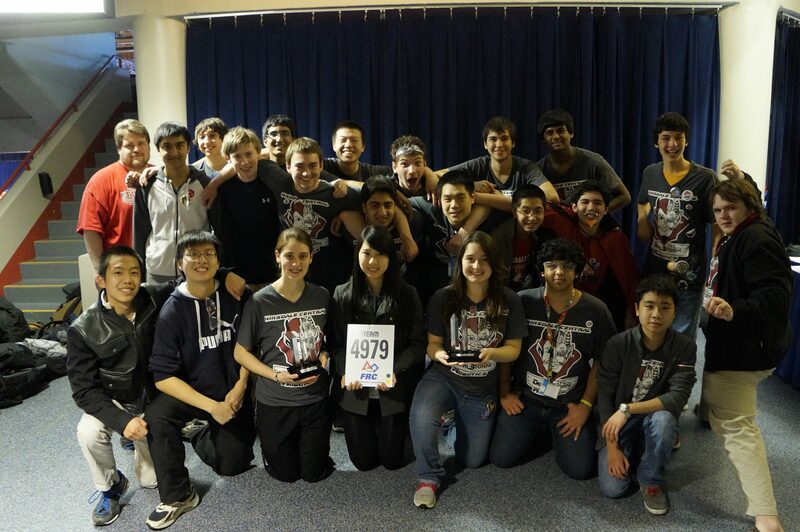 At the World Championships, DevilStorm Robotics was one of 400 robotics teams competing in 4 divisions and were on the winning alliance for 2 of the 10 games they played. The DevilStorm Robotics team is pictured above at the Midwest Regional holding the Rookie All-Star trophies they received at the awards ceremony. Congratulations to everyone involved with the DevilStorm Robotics team. These kids know how to Reach Higher!